The purpose of YWOP clubs is to create opportunities for young female students to discover their gifts and abilities and grow in confidence in positions of leadership. YWOP Clubs are a creative outlet for teen girls to discover their strengths in various positions of leadership and activities while using their influence to change girl culture in their schools and community. The clubs are weekly meetings that are student led with an adult Mentor/Adviser who oversees the club, guiding the young members in their leadership roles. These clubs will be located in the community open to girls 12 to 18 creating a safe environment for these young women to lead. The club is designed to build up young female leaders, mentoring them to make a difference and helping them discover who they are created to be by giving them opportunities to discover their gifts and abilities through various leadership activities and challenges. For girls who have not yet engaged with their school or community YWOP clubs gives them an opportunity to grow in confidence and help them find a place to belong so they will in the future have the confidence to be involved in school or community. These weekly meetings operate for 2 hours after school. Each week within a month there are 4 different focuses that develop various skills in girls such as critical thinking, global awareness, community involvement, interpersonal and social skills, leadership, fun and more. If you know of any girls who are looking for a community that is drama free, a safe place to grow and discover what you’re made of while having fun doing it… Then YWOP FEMALE LEADERS is what you are looking for. Be a part of YWOP history. Revealing female greatness so she can lead with purpose. Location: Southside Victory Centre – 6402 1A Street SW Calgary (right beside Chinook LRT Station). 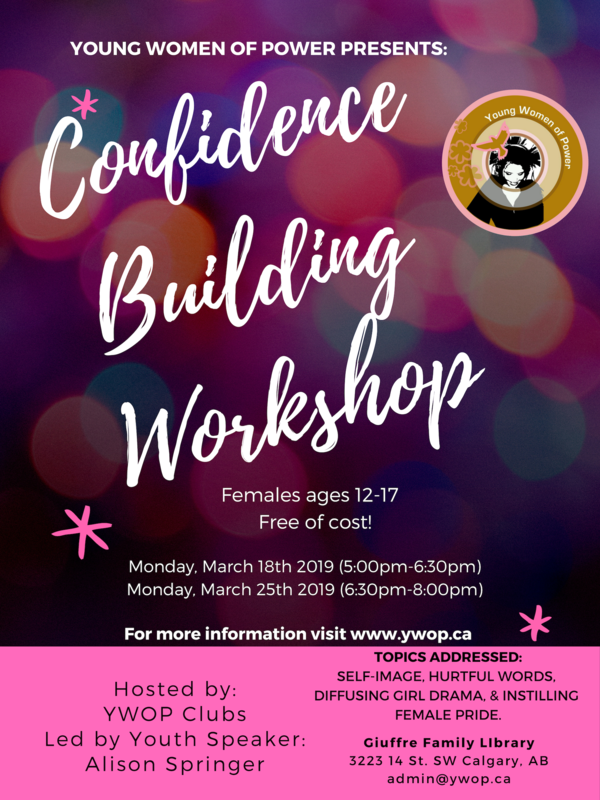 Adult Advisers: Alison Springer & Zoë B.
Email us at admin@ywop.ca text or phone Alison Springer (403) 383-9436 with any questions you may have.